In his belt-tightening medium-term budget policy statement on Wednesday, Finance Minister Nhlanhla Nene failed to provide the considerably increased finances that the South African National Defence Force (SANDF) would require to tackle the enhanced peacemaking role that President Jacob Zuma envisages for it. 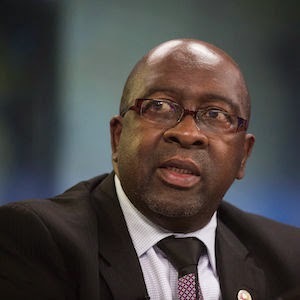 Nene’s gloomy – but realistic – mini budget raised searching questions, in particular about the African Capacity for Immediate Response to Crises (ACIRC). This is the clumsy name for what is supposed to be an African Union (AU) initiative to establish agile, rapid-response forces, formed from volunteer nations to tackle security crises across the continent. ACIRC is very much Zuma’s pet project. It was inspired by the AU’s lack of progress in establishing its formal African Standby Force, which has, in the meantime, compelled the continent to rely on outside forces – particularly France – to come to the rescue in places like Mali and the Central African Republic. To Zuma in particular, this was tantamount to opening the door to neo-colonial meddling in Africa. Zuma hosted the first ACIRC summit in Pretoria a year ago. He also expended substantial political capital in getting the initiative adopted by the AU at its summit in January this year. This was against the opposition of Nigeria, in particular, which feared that ACIRC was giving Pretoria too much power. When the Defence Review Committee discussed its review with him before publishing it earlier this year, it was apparently Zuma who told it to scale up its ambition. The review, adopted by cabinet in March, concluded that the Defence Force is in a critical state of decline – both in its equipment and in the abilities of its personnel, of whom there were far too many, consuming some 52% of the R43 billion budget. The review authors set down five milestones to be reached, depending on the level of ambition that the government was prepared to invest in the rejuvenation of the force. Apparently the committee itself was ready to settle for Milestone 3, but Zuma – not surprisingly perhaps, urged it to go higher and it ended up recommending Milestone 4, which in effect meant beefing up the SANDF to play the role of peacemaker on the continent. The committee calculated that the Defence Force budget would have to nearly double as a ratio of gross domestic product (GDP), from its current 1,1% to 2% (the global norm) to achieve Milestone 4. As Jakkie Cilliers, Executive Director of the Institute for Security Studies wrote in June this year in a policy brief titled The 2014 South African Defence Review: rebuilding after years of abuse, neglect and decay, fulfilling the review’s recommendations would require Finance Minister Nene to find an additional R11,7 billion in the 2014/15 financial year and R11,2 billion the year thereafter for defence. But there was no sign of that in Nene’s statement on Wednesday, or in the accompanying adjusted estimates of expenditure. ACIRC received a passing mention as the estimates said the target for reserve force ‘person days’ would be increased to 2 871 852, due to the increased requirement of forces for ACIRC and border safeguarding. But there was no money. ‘There is no additional allocation for the deployment of the defence force as part of the African Capacity for Immediate Response to Crises in the mini budget for 2014,’ David Maynier, the defence spokesperson for the Democratic Alliance said. ‘With the Defence Force facing cuts of more than R700 million in this financial year, the deployment is unlikely to be funded from within the existing defence budget. Does this then mean the end of South Africa’s leadership role – or any role for that matter – in ACIRC and the like? As Cilliers points out in his policy brief, the Defence Force has options, if it chooses to take them. The one would be to make substantial savings in other areas, to free up money. The more obvious one would be to slash the bloated staff complement, many of whom are not fit for purpose. Another would simply be to separate the veterans’ administration from the Defence Force and move it to Social Welfare, where it perhaps more logically belongs. Nonetheless, the government might need to relook that option in the obvious absence of independent financing to realise its large continent ambitions. It was revealing that at the United States-Africa Leaders summit, which President Barack Obama hosted in Washington in August this year, the United States offered support, in training and logistics, for establishing an ACIRC headquarters capability. Was that a sign of things to come?